As has become a PVA tradition, we invited our local NM legislators to the meeting to give us a summary of their experience at the Roundhouse during the session. We were happy to have four legislators able to attend: Representatives Micaela Lara Cadena, Nathan Small, and Rudy Martinez, and Senator Joseph Cervantes. Rep. Lara Cadena said the energy, rhythm, and excitement of the session was what carried her through. She praised the Roundhouse staff for their diligence. She is very proud to have passed two important bills: HB7 and HB285. Senator Joseph Cervantes, gave us the “behind the scenes, honest, dirty details” of what happens in Santa Fe (which is invaluable). He told us about his work on the Conservation Committee and Judiciary Committee (the last committee to hear bills and “where the sausage gets made”). He said he enjoyed working on the hard bills. For example, he passed SB323, which decreases the penalty for possessing small amounts of marijuana, and he said is the first step to legalization. He also passed SB328 which relates to domestic violence and gun ownership. Half a million dollars from his capital outlay has been designated to the J. Paul Taylor Monument. Rep. Nathan Small described the session as impactful. He said the needle was moved in every area, and we can be proud of our delegation from Doña Ana County. “Who has the best clean energy bill in the country?” asked Nathan, referring to the passage of HB489. The bill ensures NM will have 100% carbon-free energy generation by 2050. You can read more here. This was a complex and controversial bill but Nathan feels the end result is positive. Rep. Rudy Martinez, who makes the nearly two hour drive each way to attend PVA (we appreciate it, Rudy! ), spoke about welcoming 20 new members to the House, sitting on the Appropriations Committee, funding PreK-12 appropriately, and important bills that were passed through the “rocket docket.” Bills he’s especially proud of are HB512 (regarding firefighter retirement), and HB643 (regarding care of veterans). What happened with HB51? Rep. Lara Cadena spoke eloquently about her disappointment with the Senate for voting against this bill, which would have decriminalized abortion in NM, period. She said some people responded to fear-mongering and outright lies about the bill. Her memory of the day she voted for the bill is etched permanently in her mind, as she was threatened by angry crowds and feared for the safety of her children. Rep. Joanne Ferrary’s sponsorship of the bill was an example of her bravery, and Rep. Lara Cadena commended her highly. Passing the mic at PVA isn’t Eric Walkinshaw’s only talent, although it’s an important one! He is also on the Board of Casa de Peregrinos. Eric gave his thanks to the NM legislators for their work throughout the session. He hopes that CdP will be receiving capital improvement project money for a new facility. For more information, contact Eric. For more information, contact Yvonne. Earl Nissen has come out of retirement to become a salesman for a very unique and useful product. 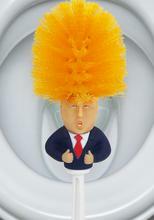 Clean your toilet with this Trump Toilet brush when: the news is too depressing, the president of the United States leads chants of “Lock Her Up,” you feel hopeless about diminishing human rights, you’re frustrated about climate change denial, or any number of other things that make living day-to-day so tough. Check out the product here and get scrubbing. Earl also mentioned his disgust with Education Secretary Betsy Devos. Her recent decision to cut all funding for the Special Olympics is unacceptable, said Earl. These are important issues, and he reiterated that one must speak up and do something. For more information, contact Earl. The Coyote Killing Contest ban was passed and will (hopefully) be signed by Gov. Lujan Grisham. For more information, visit SWEC’s website. Mairead (pronounced like parade with an “m,” she explained) McCarthy spoke about Doña Ana Communities United (DACU), which is a small community based organization conducting projects that focus on health equity. One of the projects is a timebank, where people exchange services using time as currency. Their current campaign – Human Kind United – extends the timebank to incarcerated people and their families. They’ll participate in a pen pal program, a monthly newsletter for inmates, and accompanying policy advocacy. Three relevant bills are on the Governor’s desk to be signed: HB 364 (restricting solitary confinement), HB 370 (criminal record expungement act) and SB 96 (removing conviction info from job applications). If Human Kind United raises $6000 by April 12 they will be eligible for $100,000 in grant money. For more information, contact Mairead, or check out their social media: Facebook here. Twitter here. Visit the website to make a donation. Dr. Hiranya S. Roychowdhury encouraged everyone to mark your calendars for the third annual March for Science. Hiranya also expressed the not-so-cheerful sentiment that because of the climate catastrophe, we have 10 years before: It’s All Over. Therefore, now is the time to do something. One easy thing you can do, he suggested, is to contact your legislators and ask them to support the Green New Deal. He also pointed out that students are the key, explaining that with a science education, they can literally save the world. For more information, contact Hiranya or visit the Facebook page. Don Kurtz was happy to introduce family who was visiting – his nephew and neice and their children. We hope to see them back at PVA on their next visit, too! A Lot Happened in Santa Fe in January & February. Want to Know More About That? Debra Hathaway is the newly elected vice-president of the Federation of Democratic Women of Doña Ana County; she invited everyone to a legislative roundup, where local legislators will be able to talk about the session and answer questions. For more information, visit the FDWDAC website. County Commissioner Shannon Reynolds reminded everyone about the Democratic Party of Doña Ana County’s upcoming events. First, the Friday night dinner (keynote address by Xochitl Torres Small) on March 29, and then elections for leadership on March 30, both happening at the Convention Center. Also, your electric bill will be going up in May. Shannon said the commission is trying to fight this and have asked EPE to prove that a new substation is needed (they have not responded). For more information, contact Shannon. Rosemarie Sanchez, equipped with visual aids, announced her support for Mona Trempe for County Chair of DPDAC. She said if you want an ethical, non-judgmental, organized person, then vote for Mona on March 30. For more information, contact Rosemarie. The aforementioned Mona Trempe said that if she’s elected as County Chair she has several goals. In order to get Democrats elected up and down the ballot, she believes the County Party needs to GOTV, organize, communicate, and work together within the Party and with others. “I am confident I can bring calm, dedicated, efficient, and effective leadership to the team,” said Mona. The election is March 30, 8:45am, at the Las Cruces Convention Center. For more information, contact Mona. Vince Gutschick is hoping someone from CD2 will attend the Citizen’s Climate Lobby Conference and Lobby Day, in Washington, DC, in June. If this is of interest to you, Vince will put you in touch with Bill Barron, who is the organizer for the Wild West Region. You can read more about CCL’s climate change solution here. For more information, contact Vince or visit his website. For more information, contact Pat. Inspiring Words, a Book Recommendation, and You Guessed It – Support for Mona! Luis Guerrero said he’s been reading a book that is life-changing. “It will blow your mind,” said Luis. Run for Something by Amanda Litman. Amazon link here. Luis went on to say that it’s easy to complain about stuff. “My wife knows, I certainly complain,” he acknowledged. “But a better strategy is to get involved, show up, and do something. Especially at the county level.” With that said Luis reminded everyone to vote in the county elections, and he is supporting Mona for County Chair. For more information, contact Luis. Terry Huck is the Secretary for the Las Cruces group Justice for All, which focuses on humanitarian responses to immigration issues. You can read about one of their demonstrations here. Terry announced a Fine Art Raffle, which will raise money to help refugees and DACA recipients. You can win fine art by accomplished local artists. For more information, contact Terry. I am excited to announce I am a candidate for Las Cruces City Council, District 2. After thoughtful consideration and spending the last few months in Santa Fe in a role as an advocate for progressive legislation, as well as advocating to bring resources into our community, I am prepared, committed, and anxious to work to keep Las Cruces moving forward as District 2 City Councilor. For more information, contact Connie or Tessa. Friends of the Organ Mountains-Desert Peaks director Patrick Nolan shared an upcoming event celebrating the 5th anniversary of the OMDP national monument. He also commended Representative Angelica Rubio for her work to get the Outdoor Equity Fund passed through the legislature. For more information, contact Patrick or visit the website. Cherokee also made note of the hard work, on behalf of HB51, of Rep. Joanne Ferrary, Rep. Doreen Gallegos, and Rep. Georgene Louis, and she thanked them for their leadership. For more information, contact Cherokee. One Big Win. One Big Loss. As the Policy Associate for Young Women United, Kat Sánchez said it was a personal defeat for their coalition (which includes Respect New Mexico Women) to see HB51 fail. “However, we thank our Doña Ana County champions for their support in the face of adversity and threats.” She also said calls and emails in support of HB51 and HB89 made a difference. HB89, a bill which vastly improves contraception access, especially for people living in rural areas, did pass. The work continues, said Kat, to keep abortion safe and legal for New Mexico women. For more information, visit the Young Women United website. LCPS President Ed Frank spoke about the Joint Powers Agreement between LCPS and the City of Las Cruces to expand Community Schools. He gave credit to David Greenburg as well as the lawyers involved for putting the agreement together. Las Cruces has one community school, at the moment, and it’s doing incredible work and is a big success within the community. “Kids who attend Lynn Community Middle School learn that school is there to help and not something that is out to get them,” maintained Ed, adding, “The parents are on board and that seems to make all the difference.” He said he would like to see all 41 schools in the district become community schools. To see an overview of the accomplishments at Lynn, click here. For more information, contact Ed. At the DPDAC election on March 30, Kathy said she will be supporting Joann Vullo and Rusty Pearce, and she’s sure the people opposing them are great people, too. “We have to accommodate dissent. It okay to disagree,” said Kathy. For more information, contact Kathy. Jan Hertzsch explained what will be happening at the DPDAC election on March 30 (election of precinct, district, and county directors, plus voting for State Central Committee members, and voting on platform changes). Of organizing within the community, he said, “This stuff works.” Most of the time at precinct meetings, when electing a precinct chair, the chosen individual sighs and says, “Ok. I guess I’ll do it.” Jan hopes to change this, by showing people that getting involved can be fulfilling. He said he recruited five new precinct chairs and looks forward to working with Dis. 37 volunteers, in preparation for 2020. For more information, contact Jan.
“Do you want to know who Karen Trujillo’s replacement will be on the Doña Ana County Commission?” asked Maggie Reynolds. Yes, Maggie! We’ve been on the edge of our seats waiting to get this news! It will be Manny Sanchez, Maggie informed us. Congratulations, Manny! For more information, contact Maggie at 575-288-6226. It’s Pledge Week at KTAL-LP, Las Cruces Community Radio, announced (KTAL radio show host) Peter Goodman. “Las Cruces talking to itself is going great,” he said, “but we are still very much hand-to-mouth. As newspapers slowly die, community radio is very important.” He urged people to give money as well as ideas about how to make the station even better. “Kevin [Bixby] is telling me to tell you that a $500 donation will get you a Prius raffle ticket,” added Peter. Peter’s show is on Wednesdays from 8am-10am. On April 3, he will have a climate change discussion, and on April 10, he will be talking to New Mexico Legislators. For more information, contact Peter or visit the website.